Eton Manor is as impressive as its name suggests, a great outdoor tennis facility. The courts, sporting their navy blue playing area, sky blue surrounds, and bounding boards of fuchsia pink are a sight in their own right…the colour scheme is cheerful even under a lowering sky that is threatening, and later stops play, with heavy rain. I was impressed with the facilities provided to ease spectating by those in wheelchairs – spaces reserved and incorporating seats for their companions. A small thing, but it showed thought and planning and underlined the aim to make this Summer Games accessible for all. Our first stop was to grab a hot chocolate, and then we made our way onto Centre Court. The game about to begin was the Men’s Quad final between Peter Norfolk (GBR) and Anders Hard (Ned). 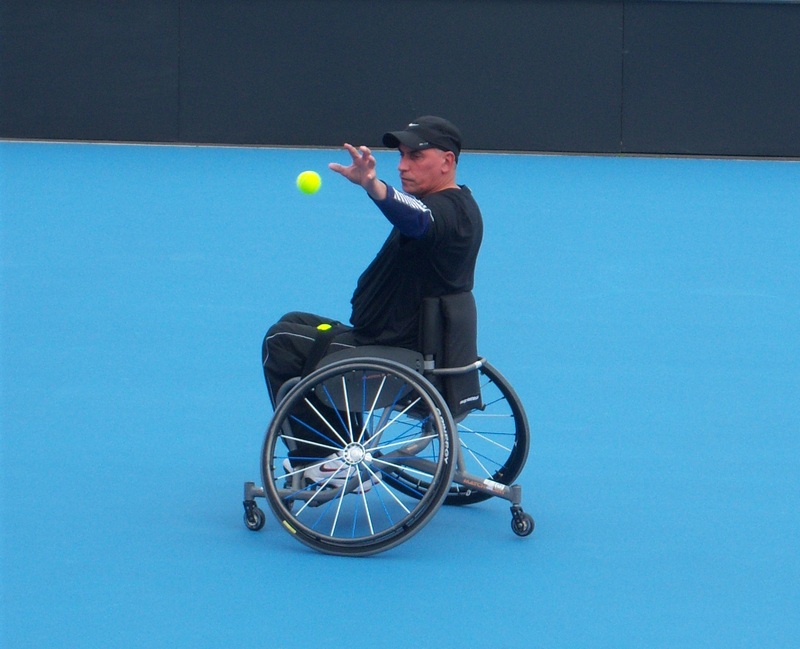 I am not sure what I expected from a category on competition designed for participants with three limbs affected by disability, but from the moment they swept on to the court seated in one wheelchair and using their competition chairs as trolleys for their bags and racquets, I was spellbound. The preparation to take to the court was lengthy, and involved changing chairs, but more importantly the binding of racquet to arm that resulted in it seeming to be an extension of their bodies. During the warm-up I concentrated on each athlete in turn and soon realised that each was very different in the way they stroked and served the ball, but they shared on great talent – incredible accuracy with their shots. They seemed to instinctively know exactly where they were in relation to the court, even when they had their backs to play, which often they did in order to make their shot. Their wheelchairs were more like…supercharged chariots, stabilised with an extra framework of three fast spinning trolley type wheels which kept balance as they spun and twirled on their negative camber main wheels. One hand stopping, starting, guiding the chair, while the other completed complex saves and shots to fight out every point. The principles that guided their games were amazingly similar to those I had learnt years ago, space for the arm to make a stroke, use of spin to control and confuse, speed of racquet arm, be moving before the opponent makes contact with the ball, chose the right time to attempt a winning shot. In this final, after play resumed following a two hour rain interruption, Norfolk emerged the victor and confirmed his place at the top of the Men’s Quad Tennis rankings. The following match, the Ladies’ Finals, was between Esther Vergeer (Ned), amazingly unbeaten since 2003 and a young rising British star, 19 year old Jordanne Whiley. London 2012 will surprisingly, given her youth, be her second Olympic Games and her appearance in the final of the test event gave fair warning of her intent. These women were not Quad athletes, but had two affected limbs. Their power, speed and agility was amazing. They whirled around the court, flung themselves full stretch to return seemingly impossible balls, and entranced the audience with the stunning ballet of their match. Jordanne fought like a tiger to even the score in the first set at 5 games all, but just could not hold the set. Eventually Vergeer took the title, but I am sure she knows that soon, very soon, Whiley will break her winning run. The last match we saw, in the early evening sun (what luck!) was a Men’s Doubles Semi Final between McCarroll/Reid (GBR) and Ammerlaan/Simpson (Ned/GBR). In the tradition of early evening men’s doubles matches these athletes played the crowd as effectively as they played tennis! The game was fast and furious…imagine dodgems with no clashes. They danced around each other on the court, two large men and machines whizzing in continual dance. Stunning. The added value for me with these Parlympic athletes was not that their intense competitive spirit, their ability to raise their game when behind and control the game when in front, nor their grit, power, concentration or determination. Those things are present in all top level sport. No, for me the magic was their agility and the beauty of movement, the element of dance and the extra prowess they displayed in conquering the game, their opponents and the circumstances life had dealt them. Truly this was an inspiring day for me, one of surprises, gratitude and immense pride in what this nation can achieve when given the opportunity, but much more, the heights of aspiration for the human spirit. This entry was posted in BT Olympic Storyteller, London 2012, Olympics, writer, writing and tagged 2012 Summer Olympics, BT Olympic Storyteller 2012, Centre Court, Esther Vergeer, Eton Manor, London, Olympic Games, Paralympic Games, Peter Norfolk, Sports, Tennis, writer. Bookmark the permalink. Years ago, we lived near Stoke Mandeville and used to watch the paraplegic games there, and the elegance, almost dance-like motion struck me then. Thanks Sue…even though I expected to admire them, I was actually mesmerised by the movements. Have really enjoyed re-living our day Sally. You have detailed the tennis well and I’m glad that the world of disability receives increasing public awareness. Life is tough enough for the able bodied and these guys fill me with both admiration for their achievements and shame when I’m creeping around the house with backache. hey – Jill, don’t sell yourself short – you never stop! Also thanks for the photo – it was the one you worked so hard to get! !